Jeff Sprague, president/CEO of Greater Lima Region Inc., speaks at the Lima/Allen County Chamber of Commerce breakfast. This year’s event was held at Veterans Memorial Civic Center on Thursday morning. LIMA — Recruiting young professionals to Lima and the surrounding region is the new mantra of the region’s economic development groups, anchored by concerns that the region’s shrinking population will create a workforce shortage within the next decade. Community leaders revisited this theme during Thursday’s Lima/Allen County Chamber of Commerce breakfast, during which representatives from the chamber, Allen Economic Development Group and Greater Lima Region Inc. explained their vision to make Lima more attractive for new residents and businesses. 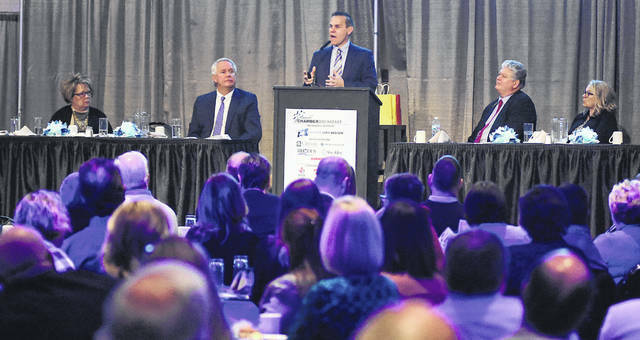 Swick noted that the eight-county region does not have a large enough population to grow fast enough to prevent the projected workforce shortage, first identified by a Department of Defense-funded study conducted several years ago. “We have to sell Lima as the place to be,” he said. Housing is a major livability issue Greater Lima Region Inc. intends to address. 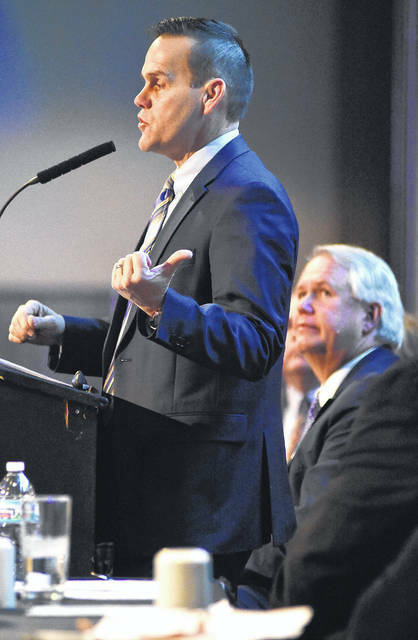 President and CEO Jeff Sprague offered the example of lower sewer tap rates, which he said were reduced to make the Lima market more attractive for builders, as one example of how his agency is already working on the issue. He said a housing survey is underway to better identify the region’s housing needs. Another challenge Sprague noted is that the Lima area — which includes Allen, Van Wert, Auglaize, Hardin, Mercer, Putnam, Paulding and Hancock counties — is in competition with Dayton, Columbus, Toledo and Fort Wayne when it comes to attracting business and new residents. The chamber and AEDG are working with Greater Lima Region Inc. on related projects. The chamber, for example, will continue its Young Professionals and Engage Lima mentoring groups, which target professionals who are young or new to the area. Dave Stratton, director of business development for AEDG, said the organization intends to make 100 business retention and expansion connections in 2019. AEDG’s other goals for 2019 include: 20 business development projects, 20 economic development projects — which Stratton said may include infrastructure, housing or zoning issues — and 10 business attraction projects.